A good bunch of my friends (including Me and Dan) like to brew our own beer. The past two years in February, we had our own home brew competition. We all came together and set up a brew crawl across the town of Lancaster. A majority of the participants live in Lancaster city so it was pretty easy to hop from house to house. Brewers that don’t live in town just match up with someone who does, giving us a lot of brews to taste! I’ll post some of the past years beers in a few days, but for now I just wanted to share some of this year’s preparations from Dan and Marisa’s House! 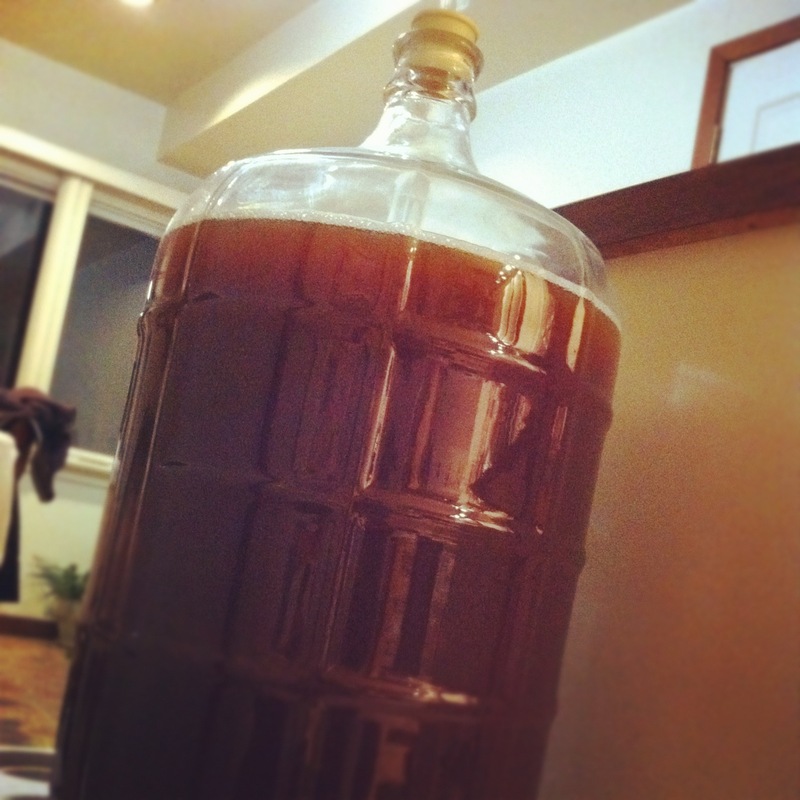 We tried to brew a brown ale this year. It turned out to be a not-quite-brown-ale. Brewing got a little interesting as we discovered we did not have a pot large enough to hold this all grain batch. 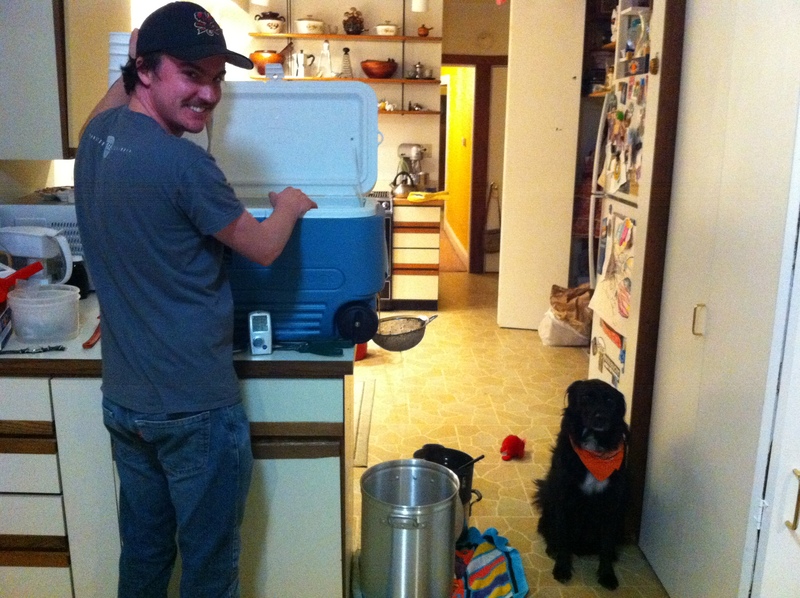 We rigged something up and got it done… we steeped it in the cooler… monk was a little worried about it. I wrote a post about brewing this batch back in November – check it out for the dog biscuit recipe. 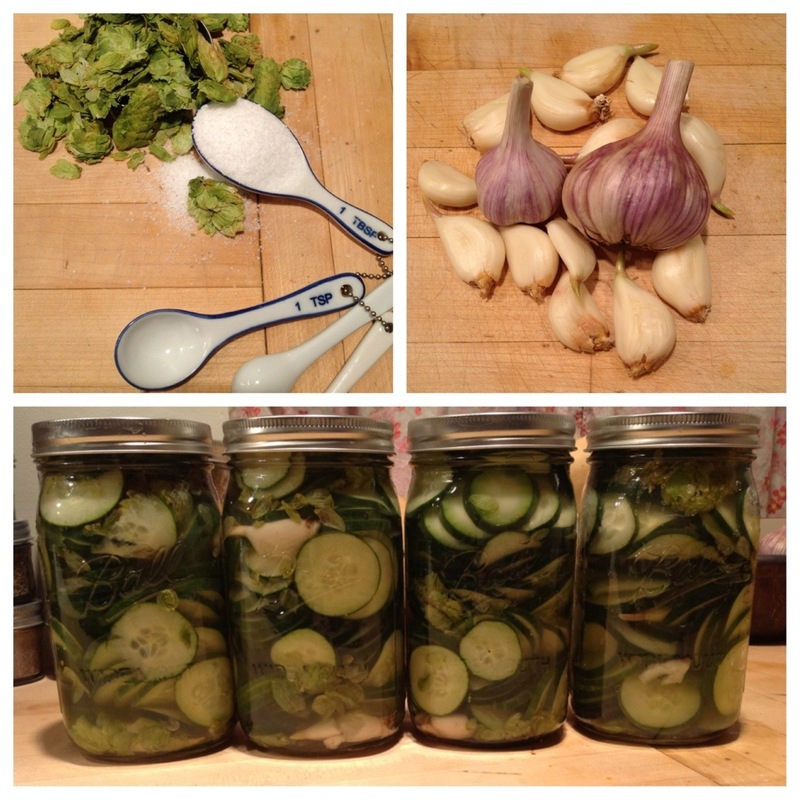 If you have been reading this blog you probably know that I love to make pickles. I’ve been playing with the idea of making pickles with hops in them for a while now. I tried several batches with different hops. I finally found one that is AWESOME! I used cascade hops steeped in the brine. I believe they came out quite delicious. I can not wait for the home brew crawlers to try them! 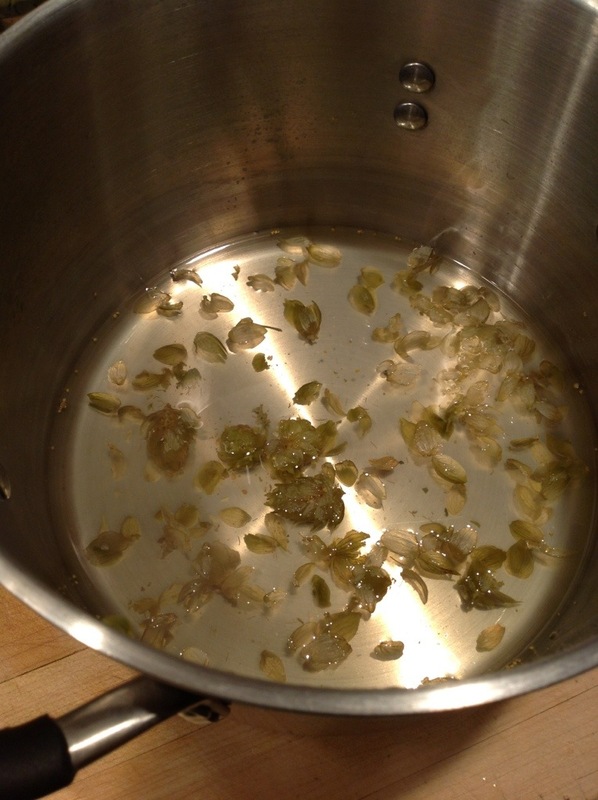 I will even admit, the cascade hops were so good steeped in the pickle brine that I ate a few right out of the pot. I can not say the same for some of the other varieties of hops. 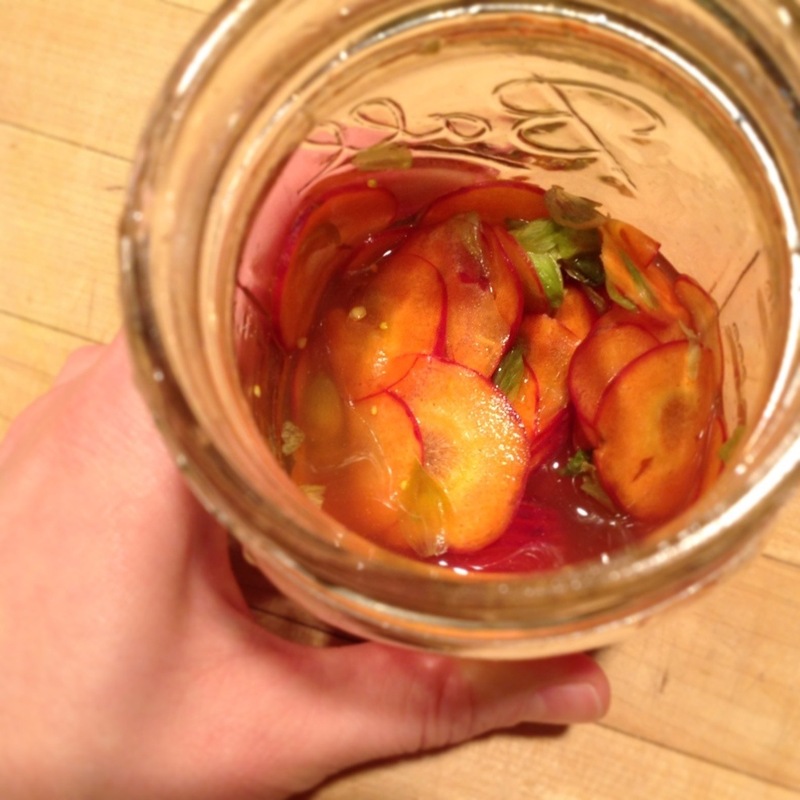 I also had this idea to pickle some carrots in the hop brine… it was a great idea. I haven’t tried the dill batch yet so I hope they are good! 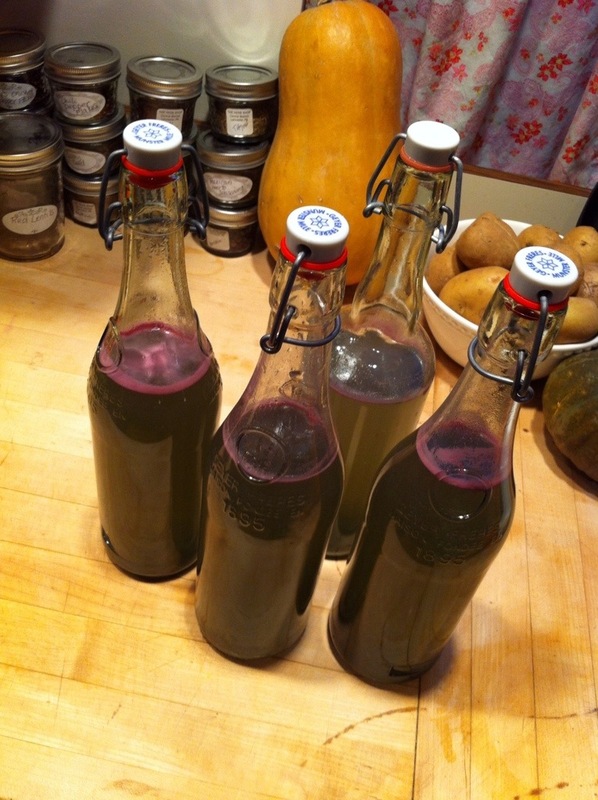 I used wild huckleberry creamed honey that I found at a beautiful winery in California and fresh ginger. I am fermenting it with champagne yeast so it’s nice and bubbly. I know it’s not beer but I really like to experiment and make new things like this… it is fermented so I think it fits… and when else am I going to get to test it out on this many tasters? I’ll let you know how the 3rd annual home brew crawl goes. I am sure there will be some awesome home brews. There are two ribbons awarded: one chosen by the official judge and one chosen by the voting crawlers. Walking around town in the crisp febreway air, tasting good beer, all in good company… I think everyone is a winner during this event! It’s snowy, wet and cold outside. February started a few days ago and my husband is away right now. Every time he goes away… I think more and more that it’s true what they say… absence does make the heart grow fonder! He’s in California right now where it is sunny- lucky him! I love California! I have been there twice, once with my husband and once with my friend Janeen. I had some awesome adventures there. I blogged a bunch of those adventures last time I was there, you should check out some of my California posts! I would and will go back to that state in a heartbeat. I can not stop thinking about one day I spent in Santa Cruz with Dan. It is one of my favorite memories and one of the best days of my life. It is stuck in my brain and makes me smile every time I think about it. Not having a plan, driving coastal California, we pulled off the highway in Santa Cruz. It was tough finding a spot to camp or stay, but we found a hippie-dippy campground with a woodpecker and other cool birds only 10 minutes from the Santa Cruz boardwalk. We pitched our tent and headed towards the ocean for the evening. There we found… the best boardwalk ever! 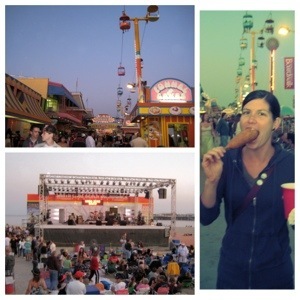 Corn dog and a Sierra Nevada as you stroll down the boards? Yes! Band playing on the beach right next to the pacific ocean? Yes! This boardwalk was excellent. Dan and I strolled around exploring the walk that seemed to go on forever. There was a huge old arcade that we walked around with some old-timey photos and displays. The penny squisher was jammed and I didn’t get a penny 😦 So if anyone find them self there… squish one for me please! 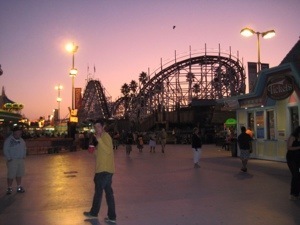 The sky turned pink as the sun set and the neon lights started to glow all around us. We took a ride on the sky ride and got a birds-eye-view of the seaside amusement park and the board walk. 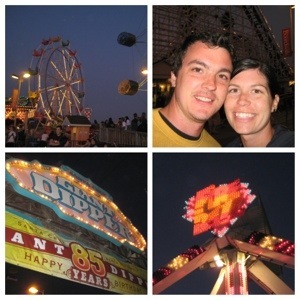 There were so many rides- the Fireball, Ferris wheel, and THE GIANT DIPPER! 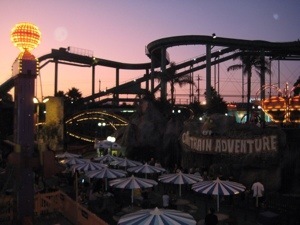 The oldest roller coaster on the West coast! 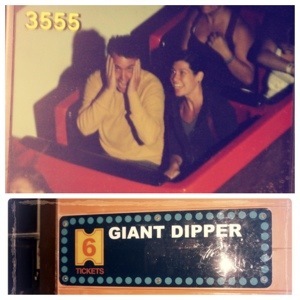 We went for a ride on the Giant Dipper and believe it or not – this roller coaster ride was our first (and only) ever together. 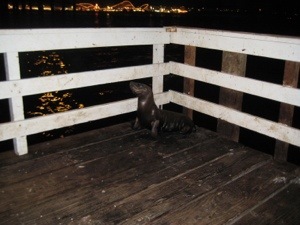 The fishing pier is huge and there are sea lion barks abound. We couldn’t find them at first – then we found the stairs. The stairs were built onto the side of the pier and seemed to go right down to the ocean. 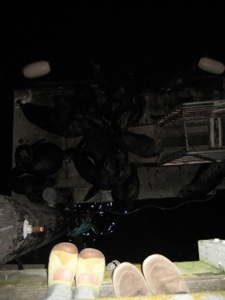 We found that they lead to several landings that were right above the water and they were filled with sea lions! They were right in front of us, and only separated by a fence! There were so many of them, just being huge, hanging out and barking. There was a little guy that some how found his way to the other side of the fence… I don’t think his momma was too happy about that. It was really exciting to see them so close. 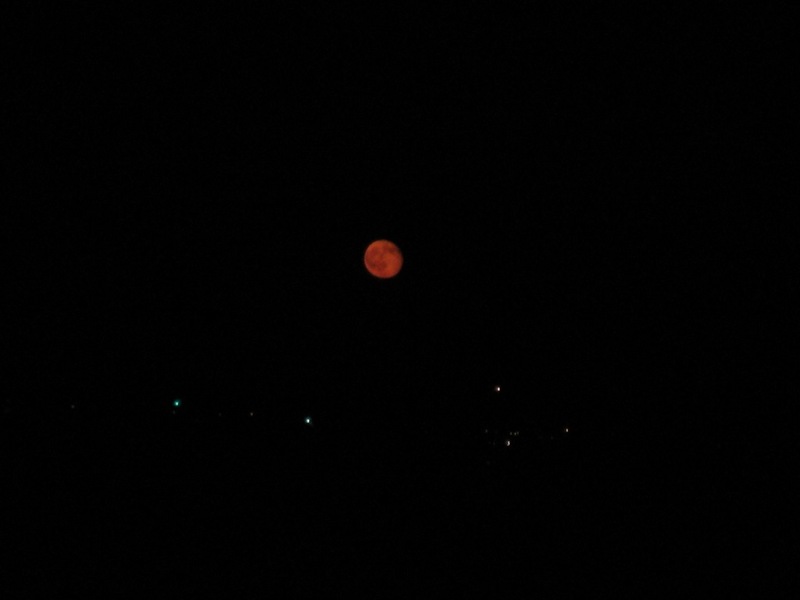 What a great night… and it was just on a whim that we stopped in this ocean town. I have realized this how my most loved travel memories are made. Don’t make plans, just go. I’m pretty lucky that I can travel with my husband like this – we take wrong turns, get lost, and laugh about it along the way… but it always leads to great adventures. Central Market: some new stands for 2013! 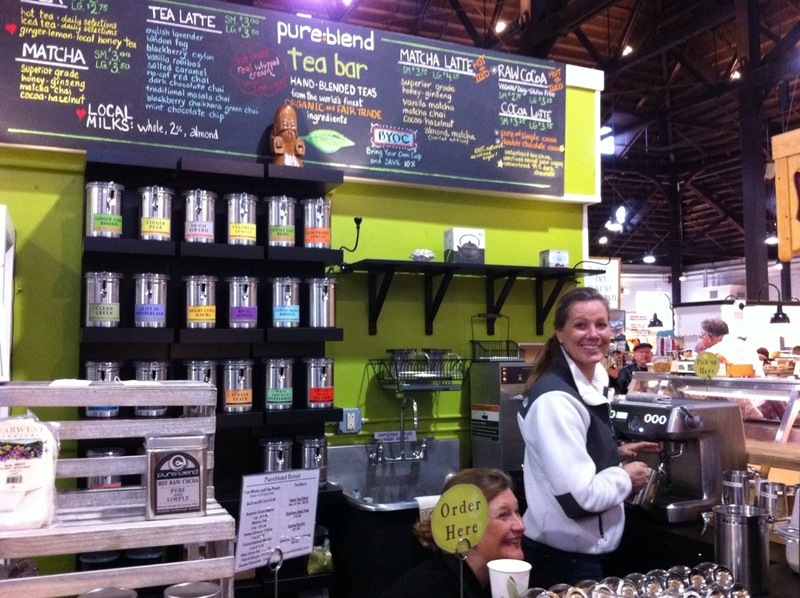 Pureblend Tea serves up specialty tea lattes and Matcha – all organic. I’ve had two tea lattes so far and they were both really good! I tried the blackberry chaikhana and the chocolate chai latte. I liked the teas, just one heads up – some of the lattes have flavor syrup in them. My blackberry tea had blackberry syrup – which wasn’t bad – I was just expecting blackberries in with the tea leaves. Sometimes the syrups are a little too sweet for me. The chocolate chai was yummy, it only had a hint of chocolate right in with the tea leaves. I did decline the square of organic dark chocolate that could have been added to it. I am sure it is good however you order – like a hot chocolate chai. I am really excited for the opening of Oasis. I saw a sign on a corner stand (that used to be Senorita Burrita) advertising their opening. They will have organic dairy products. I have recently switched over to organic milk instead of drinking soy milk all the time. I’m sure this stand will help me with that. Also new for 2013 – I am trying really hard not to shop at big grocery stores. I am only allowing myself one visit a month to a chain grocery store like Giant. My husband has gone on a little health kick and has changed his diet – I am following suit. Mostly our switches are to organic dairy products, different types of sugars, cutting out the white flour (I haven’t cut the pasta yet), and making sure we are getting plenty of veggies. I am also trying to buy as local as I can this year. I think that we eat pretty healthy already so it hasn’t been to hard – So far it is going very well. I am definitely cutting down the grocery bill, mostly because I am not buying a bunch of unnecessary items at the grocery store. Rooster Street Provisions specializes in awesome pork products!!! I got their italian sausage this past saturday. I added it to some homemade sauce and poured it over pasta. I loved it! it is worth all these exclamation points!! I can not wait to go back and try some of their other cured meats. I’ll visit them on saturday and pick out something else extra special to snack on. If you want to see some pretty pics of their products – check out their instagram page @roosterst. 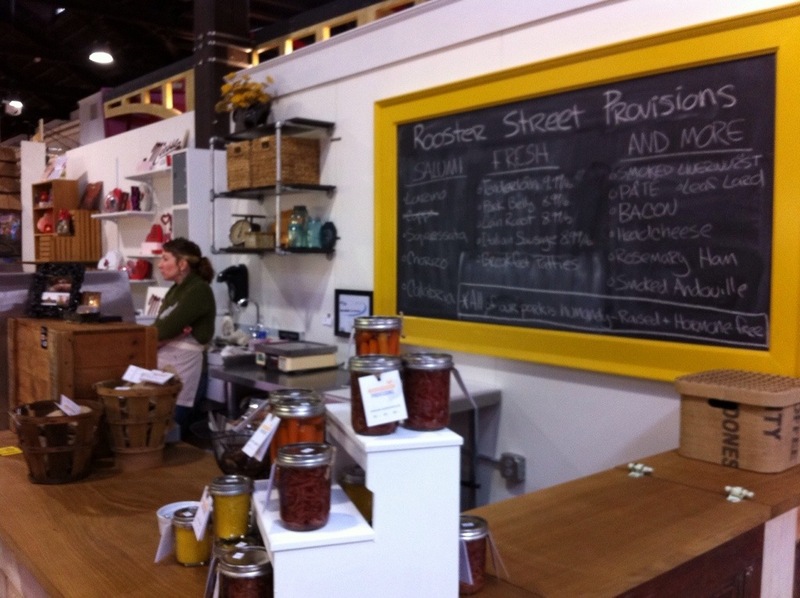 I also love their yellow framed chalkboard and wooden counters at their stand. Beautifully done! 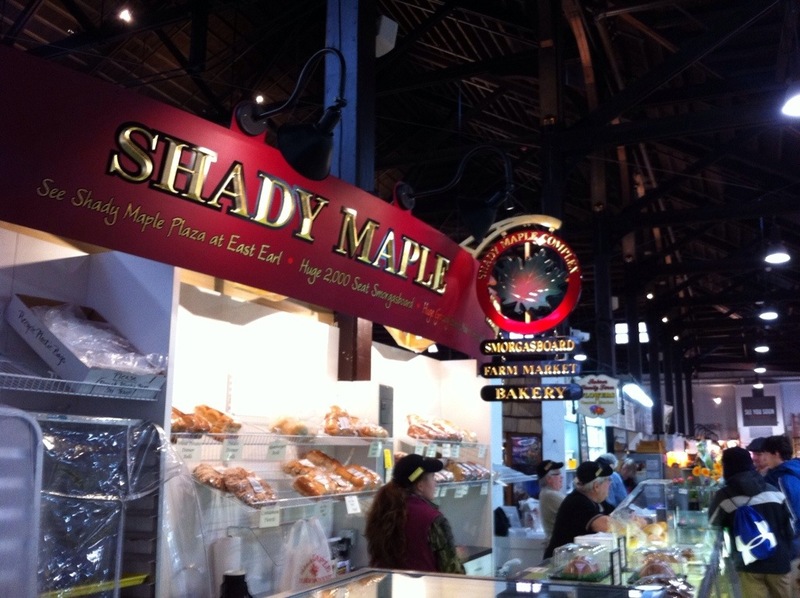 Shady Maple – chock-full of baked goods. I haven’t tried anything from here yet… I just noticed that their new sign is huge! What a contrast to the Rooster Street stand. Everyone loves a little variety, right? I did pick up a lonely looking cupcake at Wendy Jo’s. This stand has been at market for a while and it continues to be delicious. Right next to Wendy Jo’s is a food stand called Comfort Bakehouse. 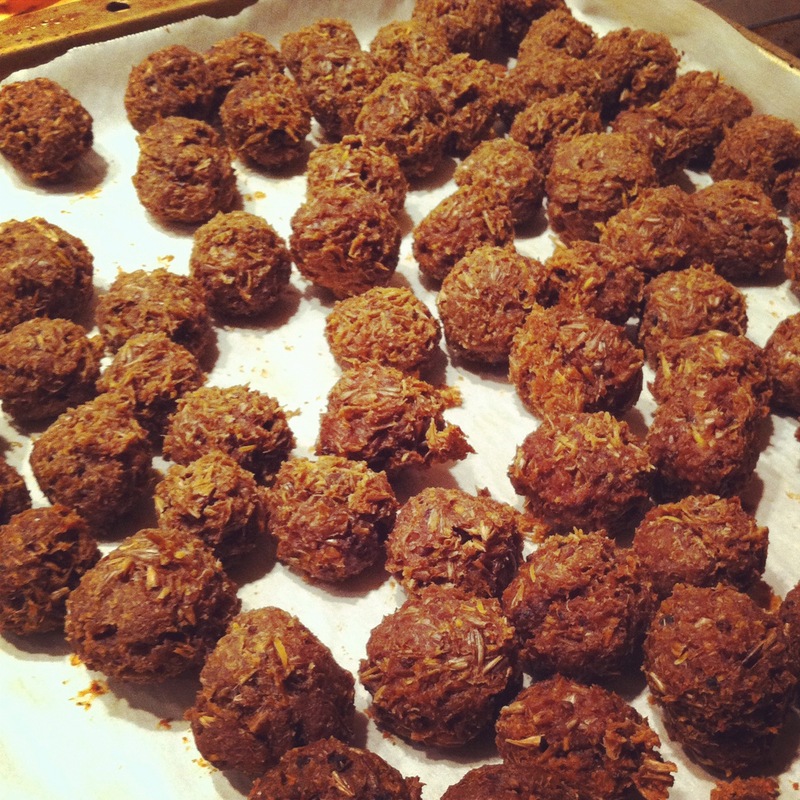 They make all kinds of foods from meatloaf to eggs… all in muffin tins! All of their offerings look quite tasty. I’m going to give them a try this week. I’ll have to decide between breakfast or lunch… or maybe I’ll just get both! I’ve tried Thom’s bread a few times now. They make a pretty solid loaf of bread – actually it is pretty crispy and fresh, not quite solid. The rosemary has been my favorite – but get there early – they have been sold out the last two weekends that I went to market. I have also enjoyed the kalamata olive – we had it with some delicious pasta last weekend. It’s perfect for dipping into sunday sauce. 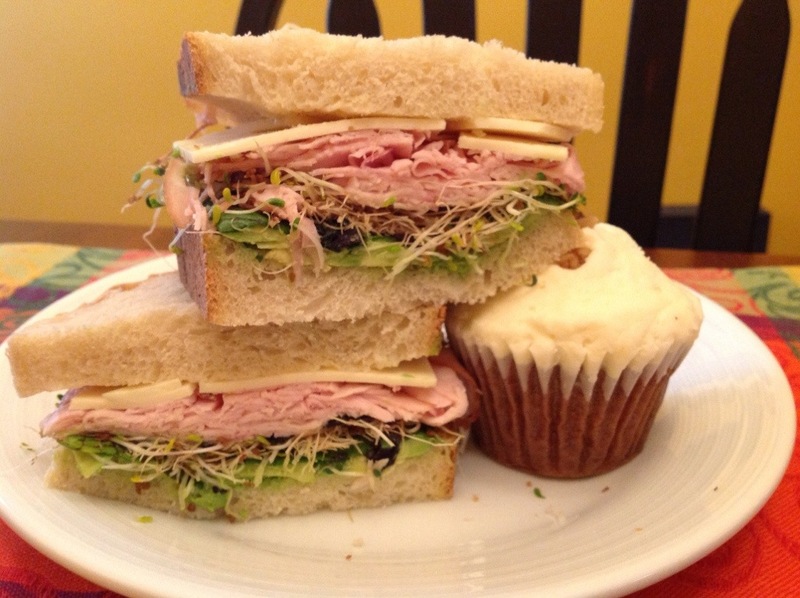 I made this super sandwich with a Rustic Italian boule from Thom’s on Saturday. Everything else on this sandwich was also from market – avocado, alfalfa sprouts, mustard greens, smokey turkey and sharp cheddar cheese. 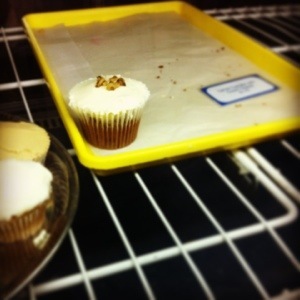 If you didn’t notice… there’s my carrot cupcake… it was scrumptious and I enjoyed it very much… I ate all of it! Remember Central Market is open Tuesdays, Fridays, and Saturdays! Hope to see you there! Wait Wait… Don't blog me!